Is anyone else having a problem with their Android app not navigating to the correct coordinates when the coordinates have been revised? 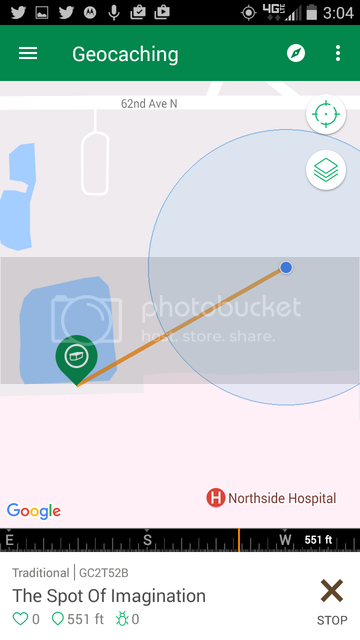 The other day I encountered one where the coordinates had just been revised the day before, but the app kept pointing me toward the old spot, which I'd assumed was a mistake on the part of the cache owner. I didn't realize until after I got home, received a private message from the owner, and then looked at the cache on my browser, that the new coordinates were working fine in the browser--I could easily see that they were pointing to a different location on the map than where the app had steered me. But the app had pointed me to the old spot. So...I figured it might be because the app needed 24 hours to refresh or something. Well, today it happened again (at a different cache), and this time the coordinates had been revised back in February, but the app was still pointing me to the old location! After studying the app more closely, I noticed this: BEFORE I touch the "Start" arrow, the cache icon displays on the map at the site of the new (correct) coordinates. But as soon as I touch the "Start" arrow the icon jumps over to the OLD location and the app points me that way! No, I mean the line which appears which points you in the direction of the cache. I'm talking about the app, only. Not Google or any other methods. Once you press the arrow for "Start" a line appears between your current point and the cache location, to show you which direction to go. 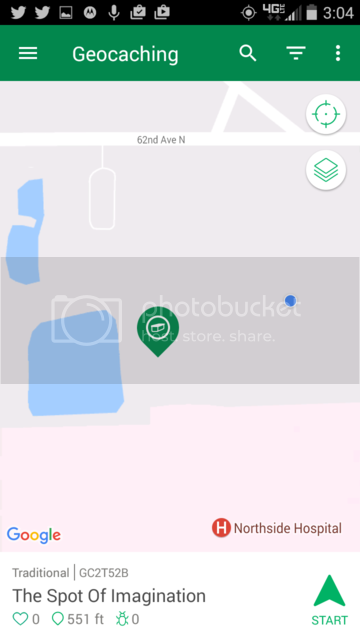 But if it's a cache in which the coordinates have been changed, once you (or rather, I) press the "Start" button the cache icon jumps on the app-map to the OLD location and the line points to it, instead of to the new/current location. If you mean you are using the Official Geocaching App, that's almost certainly the one you have, the "new" one, the App formerly known as Intro. The old paid App hasn't been available for sale in quite a while, and it now only runs offline with a lot of popups about "no network" when any online feature is accessed. Hmm, OK. Well then, why are there a whole bunch of brand-new threads (March 2017) all discussing some "new" app? There's even a thread entitled "New App for Android cell phones" which just began on March 5th. All of the responses are talking about something brand new which was just released. And anyway, regardless of all that, I still have no response of my original question: Why does the cache icon "jump" the moment the start button is pushed (on caches which have had their coordinates updated), jumping from the current/correct location to the old location? And is this a bug, has it been *officially* reported and/or noted, and when will it be fixed?? The "new app" that gets mentioned in the forums isn't really 'brand new'. It's been around for well over a year. Seems "new" and "old" nomenclature has been used to distinguish between the "free" and "paid" app. There were 2 apps, and one (free) was newer than the other (paid, classic). It probably would've been more accurate for forum posters to say "newer app" instead of "new app". ETA: There have been plenty of threads about the "new app" for months, but the activity has picked up this month because 3/23 was approaching and that day is when the "old app" was retired. Anyway, regarding the issue you're seeing. I'm seeing the opposite of what you mentioned in your OP. When I'm viewing the full page map, then I'll click on an individual question mark icon. That icon shows at the original/false coords. Once I touch the "Start" arrow, then the icon shows at the corrected coords. Are you using version 5.1 of the Android app? (Thanks for the explanation of the "new" app). As for the bug(?) -- OK, here are a couple of screen shots showing what happens. The first screen shot is BEFORE I click on the "Start" button. As you know, the blue dot is me. And as you can see, the cache is displayed as being to the east/right of the squarish-shaped pond. This is the correct location with the new/revised coordinates. However, as soon as I touch the "Start" button, the cache icon immediately JUMPS to the old/incorrect coordinates with the line pointing me in that direction, instead of to the correct location. I was able to work around this by not pushing the "Start" button at all and just walking toward the cache and watching the distance decrease. But it would be nice if the app would function properly and direct me to the new/correct location. Yes, I am using version 5.1. When I look at that cache on the map (both on website and in app), I see it at the position shown in your 1st screenshot, on the eastern edge of the pond. After I push the 'Start' button, it shows a line to that location on the eastern edge of the pond. The cache's coords were updated to this east-of-pond location on 3/25/2017. On 3/24/2017, the cache was updated to a northwest-of-pond location. Prior to 3/24/2017, the cache's coords were at the south-of-pond location shown in your 2nd screenshot. So, it sounds like the issue might've been that the cache's waypoints in your app didn't update correctly. What about today, does the app still point you to the south-of-pond location after you press 'start'? What coords are shown on the "Waypoints" screen in the app? Edited: My original post missed the part of the OP where the different coords are because of updated coordinates on the cache page. I was initially thinking that you meant user-corrected coordinates. Yes, I just came from this cache just prior to making my post with the screenshots. The screenshots are from this afternoon, about 4 hours ago. As for the Waypoints (which I never use), I just checked, and they're still showing as the old coordinates, from prior to March 24th. This same thing happened to me on Tuesday (three days ago) with cache #GC5TNPZ ("Nolan's Nook"). The coordinates were changed back on Feb 24th, but my app still points me to the old coordinates (once I hit the "Start" arrow). I checked the Waypoints listed, and they are still the old, pre-Feb-24 coordinates. It does seem that there's some sort of lag. I entered corrected coords for a Mystery cache, and the app didn't "read" those corrected coords at all - even after an hour. I logged out of the app and back in, and then the app showed that the Mystery cache was indeed "solved" and had the corrected coords in the Waypoints page. I suspect that logging out/in to the app would resolve the issue you're seeing. Although it still seems that there's an issue, because logging out/in shouldn't be needed to get refreshed cache data. I just logged out and then logged in again, and then checked the two caches I'd referred to above, and now the icon doesn't "jump" when I hit the Start arrow! I'll keep an eye on it and will test it again the next time I encounter a cache which has had its coordinates updated.